The Brexit vote will happen this Thursday, June 23, and the debate over whether Britain should stay in the EU is reaching critical mass. 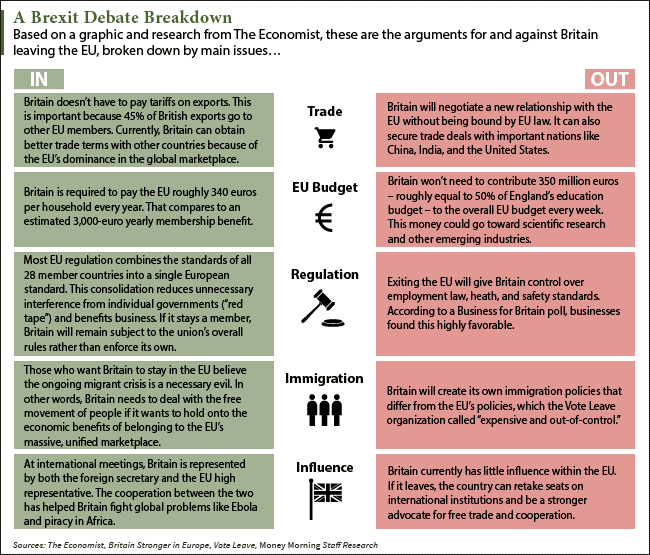 That's why we made you a helpful Brexit vote cheat sheet adapted from a graphic and research from The Economist to break down the important Brexit debate issues. On Thursday, citizens of the United Kingdom will vote on whether the sovereign state will remain in the European Union or separate itself entirely. The benefits and consequences of staying or leaving the EU have been tirelessly debated by governments around the world for months now. One reason why Britain wants to leave is the EU's negligence toward the pound. While most EU nations use the euro, Britain is one of the few members that use a different currency. That worries British citizens and officials because they believe the EU will make decisions that improve the value of the euro rather than the pound. Another catalyst for the Brexit is the EU's labor laws. The union is known for having a laid-back labor policy for workers born outside the EU. In other words, non-EU workers who migrated to EU countries are willing to work for cheap, which threatens working EU citizens. CNBC reported there are roughly 14 million workers in the EU who were not born there. The third reason is the EU's restrictive trading laws. Lobby groups in favor of a Brexit say trading within the union limits Britain's global trading potential. 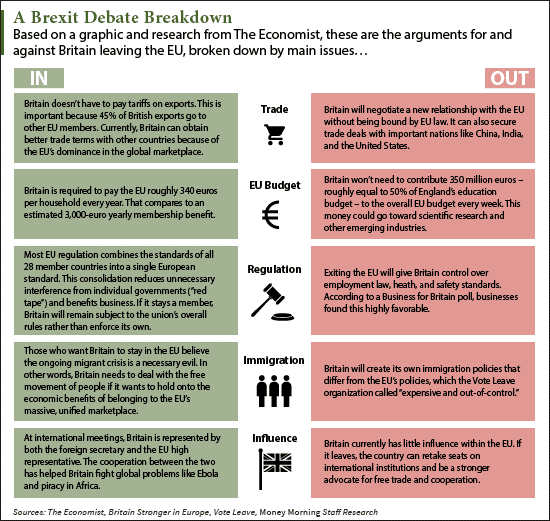 If it were to leave the EU, Britain could focus on building trade agreements with larger economies like India and China. With six days left before British voters make their decision, the Brexit referendum polls are incredibly close. As of Saturday, June 18, roughly 43% are in favor of staying, whereas 45% are in favor of leaving (11% reported "don't know"). That means this week's vote will likely be within single-digit margins. Alex McGuire is a writer and editor for Money Morning. Follow him on Twitter at @AlexMcGuire92.